Gosainkunda lake tour presents very good value with excellent lodge accommodation and food. Gosaikunda Trek or Gosaikunda tour is less crowded trail compare with other popular trekking and hiking routes in Nepal. Gosaikunda or Gosainkunda is a holy lake, an important pilgrimage destination for Hindus and Buddhist pilgrimage people. You can ascend up through more forests to the famous Gosainkund Lake to set among in high grey rocks. Furthermore that areas is a home of several wild animals such as Musk deer, Himalayan black bear, snow leopard, Himalayan wild goat and particularly birds and wildflowers. At springtime, Gosaikunda Trek covered with varieties of alpine wildflowers and the forests are multi-colored with colorful rhododendron, orchids, magnolia, and many other floral species. Moreover, you will have the best view of Mt. Ganesh Himal family, Mt.Langtag lirung (7,246m), Langtang-ri, Langsisa peak, Langtang Himal, Ganjala peak from Gosaikunda Luribina la viewpoint. You can reach Gosaikunda on your journey but it is more challenging to ascend. Gosaikunda pilgrimage trek can be done at any time throughout the year. We leave Dunche Bazaar than the trail slightly goes uphill through beautiful rhododendron, Bamboo and pine trees. During the journey to Cholang Pati, you will pass several tiny villages with local guesthouses. Chandran bari also known as sing gomba offer a best YAK cheese factory than continue your journey about 1 hour further, you can reach Cholang Pati where you can stay overnight at guest house. After breakfast, catch a coach to to return Kathmandu valley. After reaching in Kathmandu, you will be taken to your hotel. In the late afternoon, you can stroll around Thamel, the major tourist destination of Kathmandu. You can do some last minute shopping of souvenirs for your family and relatives. How much does Gosainkunda lake tour cost? 7 days Gosainkunda lake tour is available now on USD 499 per person is standard trek price on double occupancy basis. But of course, the trip price will vary according to group size. For the deluxe and luxury trekking tour plan, we add 3-star category hotel deluxe air-conditioned room in Kathmandu (BB PLAN) and with attached bathroom while trekking on possible places. AND WE ARE OPEN TO CUSTOMIZE YOUR TOUR AND PACKAGES PRICE AS PER YOUR REQUIREMENTS. International tour leaders are highly encouraged to get discount and attractive complimentary. We can arrange private pilgrimage Gosaikunda lakes tour starting at any date that works for you. Please contact us for more information. 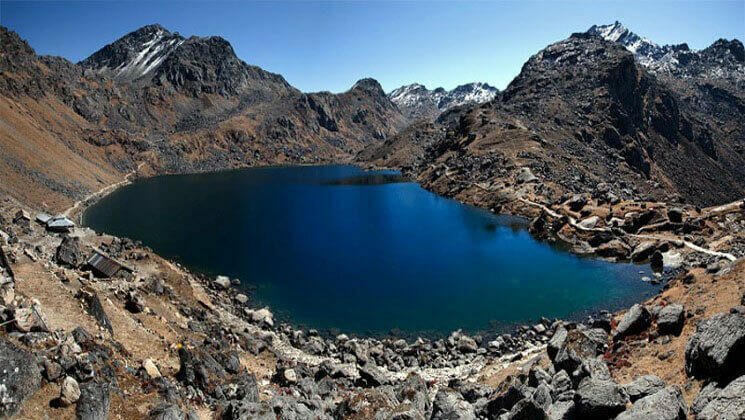 Question: Do I need the experience to do express Gosaikunda lakes tour? Question: What kind of accommodation can I expect on Gosaikunda lakes tour? Question: What opportunities will I have for shower along Gosaikunda lakes tour? Question: How do I get drinking water on Gosaikunda lakes tour? Answer: You can buy bottled mineral water into the lodges or tea shops on the trek but however we advise against buying mineral water in plastic bottles, as currently there are no provisions for disposing of these. Instead, we provide you boiled water or bringing chlorine tablets to purify the normal water as the normal water is available in campsite/along the way. Question: Is there any communication facilities on express Gosaikunda lakes tour? Question: Who will carry my luggage on the Gosaikunda lakes tour? Answer: We provide porters to transfer your luggage. As we are a responsible trekking tour operator agency, each of our porter carry maximum 25 kilo of your backpack which means 2 guest (12.5 kg luggage of each guest) : 1 porter basis. If you wish to have a private porter, you might also get it on paying an extra cost. Answer: You can allocate US$ 08 – 10 for a lunch/dinner in Kathmandu and it depends on your spending habits. US$ 7 to 10 US$ each day is enough to buy bottles of water, chocolates, tea coffee and some drinks while you are on trek. As the information stated above is just a guide and standard template what we provide you however the trip can be customized at your request to accommodate your specific requirements. Local politics, landslides, cancellation of local flights, weather, transport or a multitude of other factors that are beyond our control can result in a change of itinerary during on trip.